I am a huge fan of Zula Bennington Greene's writing, who once had a column in the Topeka Capitol-Journal called Peggy of the Flint Hills. I used Skimming the Cream, a compilation of her work as part of my research for the Seasons of the Tallgrass series. 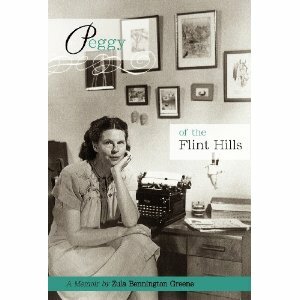 I'm eager to read the newly published memoir, Peggy of the Flint Hills. On Saturday, December 15, the Chase County Historical Society will present "Peggy of the Flint Hills: A Memoir," a newly published book, written by Zula Bennington Greene before her death. Ms. Greene's daughter, Dotty Hanger and Professor Eric McHenry of Topeka, will present excerpts from the book. The Chase County Historical Museum will open a special exhibit on this same date honoring "Peggy of the Flint Hills." The exhibit will remain open for an extended period of time. Ms Greene wrote her first column for the Chase County Leader News on October 28, 1928. She lived in the Bazaar community at that time. Local Music Group, Tallgrass Express, will be in concert that evening at 7:30 PM at the Emma Chase Music Hall. Lead singer, Annie Wilson, will perform her song, "Clean Curve Hill Against Sky", a tune inspired by the writings of Zula Bennington Greene. For more information, please call 620-273-6020. Read more about the Memoir from this Topeka Capitol-Journal article HERE. Order the book HERE.